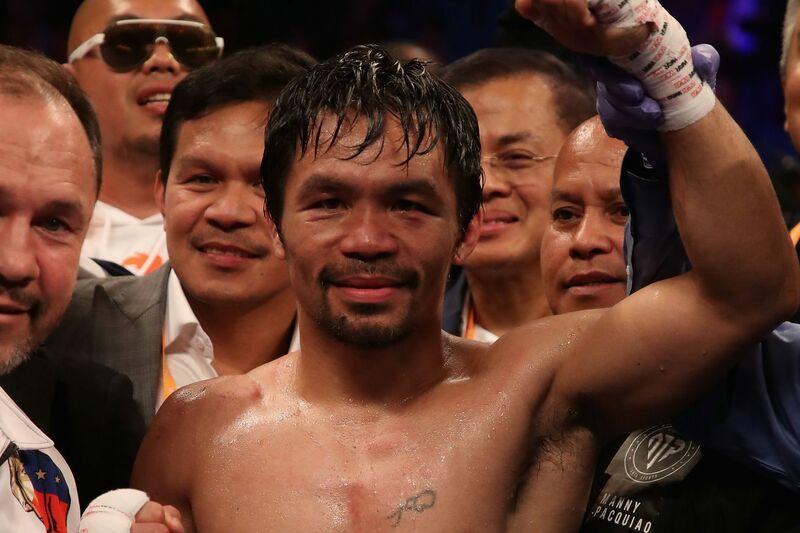 Pacquiao retained his WBA “world” title with a fairly routine victory. Manny Pacquiao is 40 years old, undoubtedly past his prime, but tonight at the MGM Grand in Las Vegas, live on Showtime pay-per-view, he proved unquestionably still too good for Adrien Broner, winning a clear decision to retain his WBA “world” welterweight title. Pacquiao (61-7-2, 39 KO) won the fight on scores of 116-112, 116-112, and 117-111, and those may have frankly been a bit generous for Broner (33-4-1, 24 KO). BLH had the fight 118-110 and 119-109 for Pacquiao. The problems Broner ran into in this fight were simple and predictable, as they’re the same problems Broner has run into every time he’s fought someone at the top level of the sport. He didn’t throw enough punches, allowing Pacquiao to outwork him handily, and his leaky defense was not at all the Mayweather-esque slickness of his delusions, as he was hit plenty. Pacquiao didn’t look like his younger self or anything here. It wasn’t a rebirth of Manny. He simply took advantage of Broner’s consistent flaws and won the fight. For most, it went pretty much exactly as expected. For those who believed Broner, at 29, might finally put it all together and become the fighter he was once promised to be, it was a sobering reality check. Asked about facing Floyd Mayweather again, Pacquiao said, “Tell him to come back to the ring and we will fight. I’m willing to fight him again, if he’s willing to come back in boxing.” Mayweather showed no reaction when put on camera at ringside. For his part, Broner tried to pretend to be outraged, an act he was putting on for every passing camera as soon as the fight ended. When Jim Gray noted that Broner was 3-3-1 in his last seven fights, Broner replied, “I may be 3-3-1 but I’d be 7-0 against you.” Gray responded, “Well, that wouldn’t mean much,” and put an end to the interview. Statistically, the fight was one-sided. Pacquiao landed 112 of 568 (20%) total punches, including a sharp 42% (82 of 197) on his power shots. Meanwhile, Broner landed a mere 50 of 295 (17%) total punches, and just 39 of 180 (22%) power punches. So the story of Manny Pacquiao will go on, and now that he’s with Al Haymon’s PBC stable, there are a lot of name welterweights for him to fight. Even if he doesn’t get what he truly wants, a rematch with Floyd Mayweather, Haymon has the likes of Keith Thurman, Errol Spence Jr, Mikey Garcia, Shawn Porter, and Danny Garcia in his stable. As for the story of Adrien Broner, it didn’t change tonight, and it’s increasingly unlikely that it ever will. But if this pay-per-view sold well, or even did solid numbers, you can bet you’ll see him again in main events. He’s someone the boxing public has tuned in to see for years, through good and bad times, and just because he lost again doesn’t mean he’s hit the end of the road.